a Reese Witherspoon Book Club Pick! A four-time SkimmReads pick, September 2017 Belletrist Book of the Month, and the February 2018 Reese’s Book Club x Hello Sunshine pick, THE LIGHT WE LOST by Jill Santopolo is an essential addition to your beach bag. 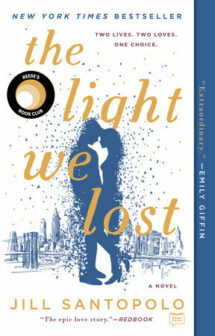 Called “The epic love story” by Redbook and “heart-wrenching yet beautiful” by Us Weekly, THE LIGHT WE LOST is an immersive, heartrending novel about the inner workings of the human heart, the lengths we go to pursue our dreams and the sacrifices we make for love. On a day that irreversibly alters both of their lives, Columbia University students Lucy and Gabe come together amidst tragedy, fueled by a deep connection found in a dark moment. What follows, over the course of more than a decade in a series of beautifully written vignettes, is a journey that brings them together and apart as they to etch out their respective careers and come to terms with the concrete consequences of following their dreams. Gabe, inspired and compelled to travel to the Middle East as a war zone photojournalist, leaves Lucy in New York, where she forges a successful career—and, eventually, a life without the person she thought was her soulmate. She gives her heart to someone new, a steady, safe, and loving man named Darren. But as time goes on, Lucy realizes that she can never give her heart away again fully as she continues to cling to the impossibly perfect love she believes she was meant to share with Gabe. As Lucy tells the story of her life, she addresses Gabe directly, sharing memories and secrets that result in an unraveling destiny and surprising, unforgettable conclusion. · This story is so moving and so honest. What inspired you to write it? · Before The Light We Lost, you’d written primarily for children and young adults. Why did you decide to write an adult novel? · What was different about writing for an adult audience? Did your process change? · Lucy’s voice is so powerful and sincere on the page. What was it like to write her character? How much of you is in her voice? · How did you come up with Gabe and Darren? Did the men change as you developed the story? · So which are you: Team Darren or Team Gabe? · You yourself were a student at Columbia University on September 11, 2001. What was it like writing about this experience through fiction? Were your own experiences similar? · Without giving anything away, did you always know how the novel would end? · You also work as an editor of children’s books. What is different about writing your own stories from editing others’? Is there one side you prefer?